You may recall my post a few years ago, 10 Great Plants for Fall Color. 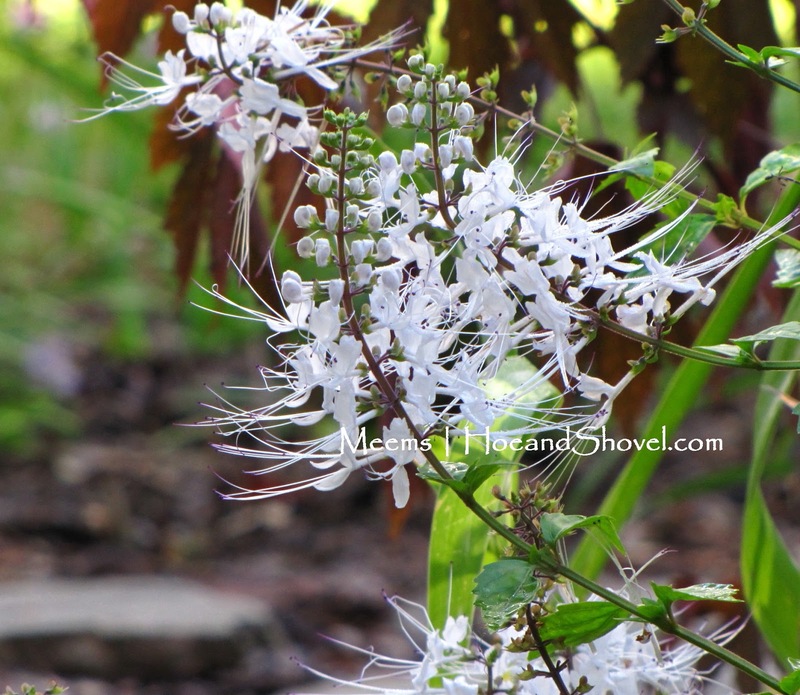 It listed mostly foliage plants with a few flowering perennials included. I've grown to love my fall garden more and more each year. That love is from a combination of the cooling weather and the fact that so many of Florida's best plants bloom in the fall. That's my observation. Here's a look at some of the flowers that are brightening up my fall garden. I'm not going to include the sunny Swamp Sunflower again. I think I have lauded those yellow flowers sufficiently already. 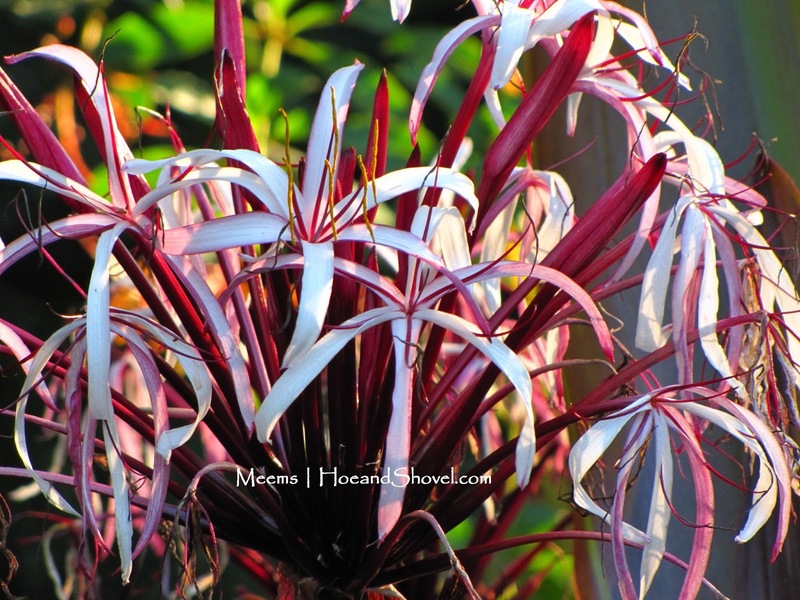 Queen Emma Crinum Lily ~ I transplanted 2 of these beauties from my old garden. I left 4 of them there. You might remember that almost every single plant I've planted in my new garden was either moved as a transplant from my old garden or it was a division or root cutting from my old garden along with a few root cuttings from some friends. I wrote here about the challenge I gave myself to start all my new beds without spending any cash. Now that I've been gardening here since June, I am beginning to see some results. The rooted cuttings are growing and many of them are actually blooming. Celosia spicata grown from seed. Sunny garden. Fall is an exciting time in most Florida gardens. We've just passed our rainy season which causes the whole garden to explode. Celosia spicata started blooming in summer, I admit. Here we are well into fall and still it is full of magenta spikes. It is 10' tall and bushy so you need a bit of space when planted in full sun. Cat's Whiskers (Orthosiphon aristatus) was given to me as a small cutting. I moved it as a small bush from my old garden to the new sunny garden. 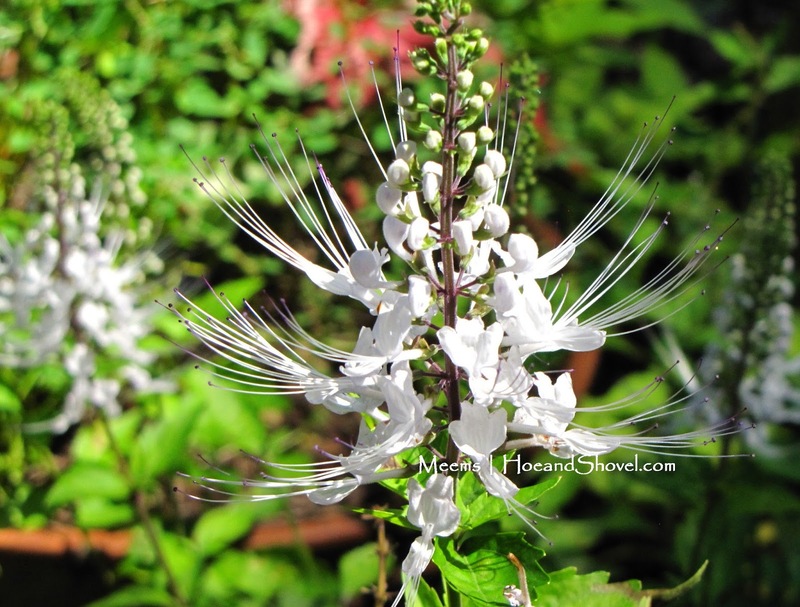 Cat's Whiskers has been blooming its spiky white flowers for three months. It likes a good deal of sun, but not full sun. I've put it where it gets some shade from the small bottlebrush tree nearby in the sunny garden. 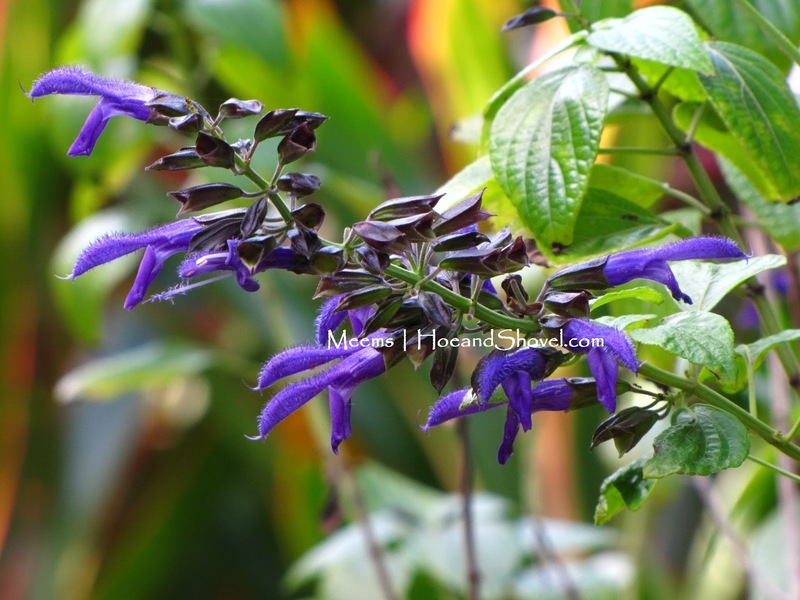 I started cuttings of Salvia Mexicana from plants I had in my old garden. These bloom somewhat all spring and summer. When fall rolls around they come into their prime covered in spikes of deep purple loveliness for bees and hummingbirds to visit. I put this pretty rose in here because she deserves a mention. 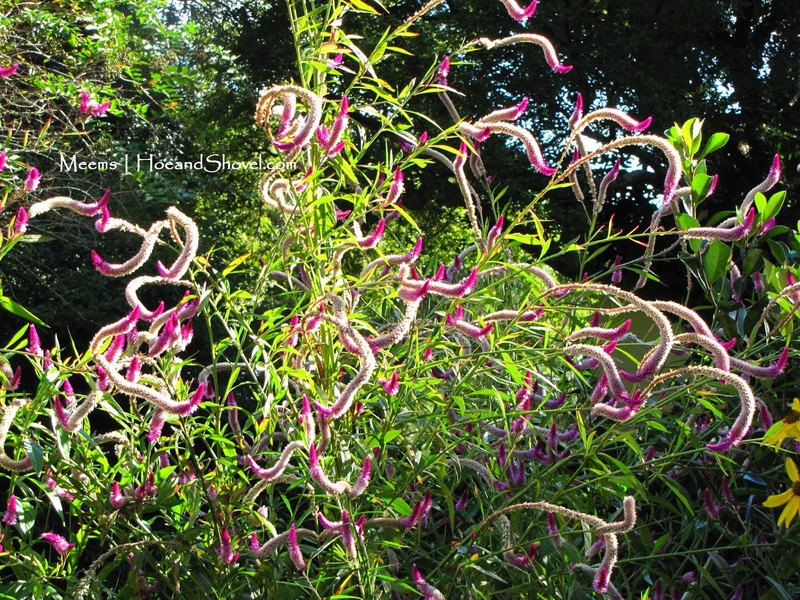 Belinda's Dream pretty much blooms all year. I moved her from my old garden. She recently was trimmed back to canes. It won't take her long to burst out in bloom again. You can't rush spotted beem balm. It definitely waits for fall to bloom. Slightly scented and unquestionably a pollinator magnet. Its pale pink flowers stack on top of each other 3 and 4 tall. 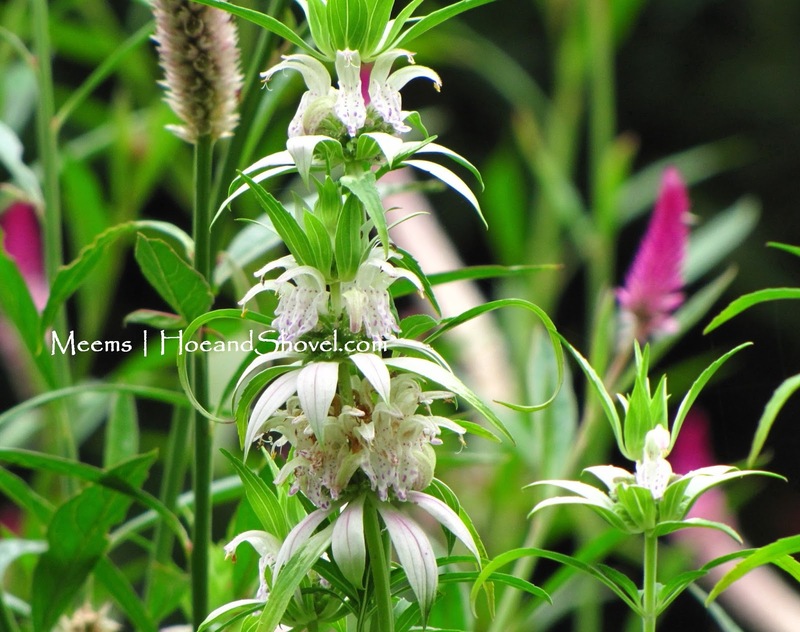 If you have a sunny location you'll want to grow this Florida native. Pentas ~ all from root cuttings. If you've followed this blog you know I'm a huge fan of Pentas. Why? 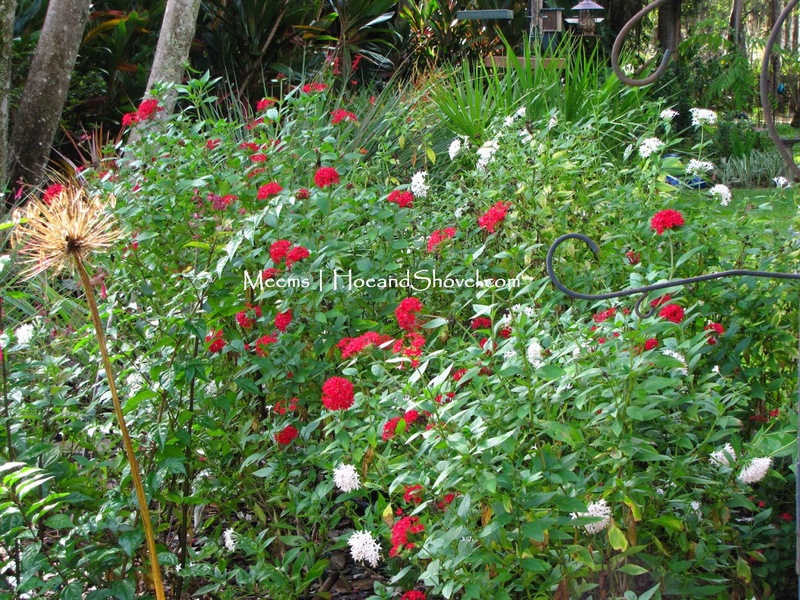 They are easy-to-grow flowers for Florida gardens that bloom all year long. I mostly plant and propagate (from cuttings) the large heirloom varieties. 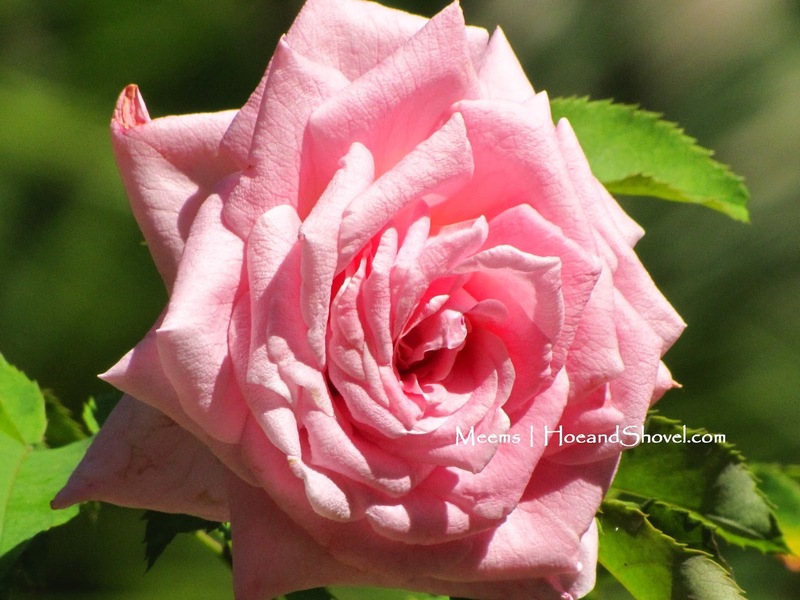 They are hardy in winter with the least amount of tree cover to protect from cold and extremely drought tolerant. 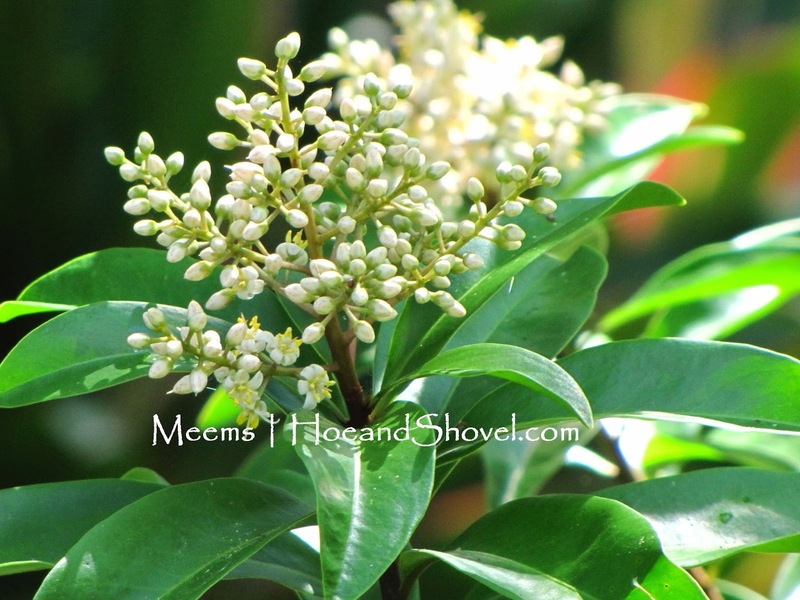 Marlberry (Ardisia escallonioides) is a Florida native shrub that blooms in the fall. Insignificant flowers? Maybe. Small pollinators love them. The flowers turn to berries later in the season just in time to feed the wildlife. This is not the tropical variety of hibiscus. 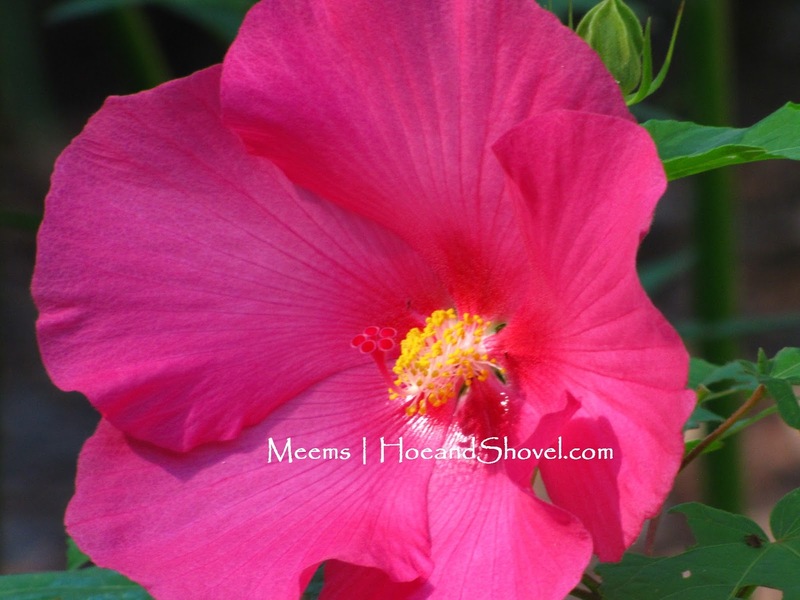 Each large pink flower of this hardy hibiscus only lasts a day and requires some moisture for best blooming. You can put these near the edge of a pond or in spot that stays moist. Mine was given to me as a cutting. I rooted it and then made more plants from that one and brought one with me from my old garden. It does not have wet feet in my garden but does get plenty of sunshine. 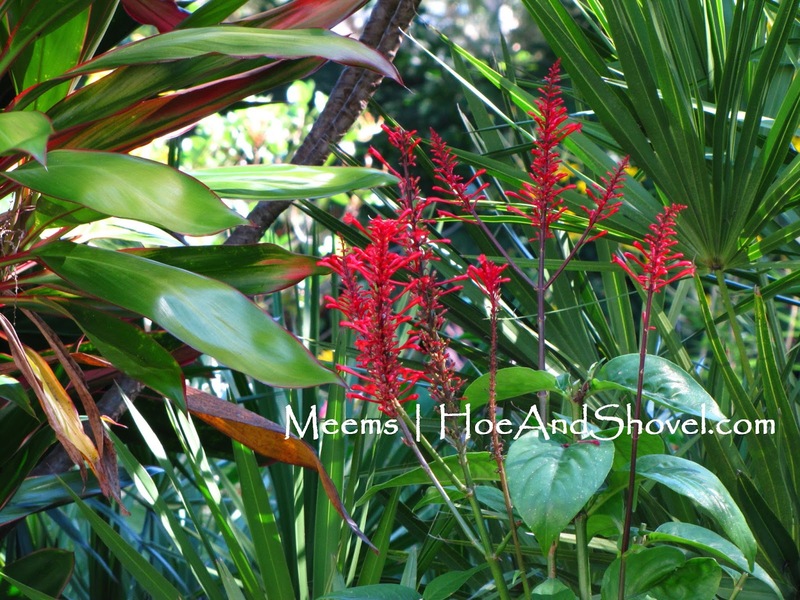 Firespike (Odontonema strictum) is an all-time favorite. All the ones I planted in my new garden are short and producing a few blooms as you can see above. There are so many reasons I love this plant. You can read more about firespike here and see more photos! It's RED!!! Okay. That's number 1. All the other reasons have to do with hummingbirds. They love them and since they flourish past fall (as long as we don't have a hard freeze~or several) the hummers will have nectar all winter. What are your favorite fall blooming plants? There are so many to choose from in Florida. Meems you have such lovely fall bloomers. The only plant that I have from your list is firespike. Although, I do have roses growing here. I love the Celosia spicata and the Cat's Whiskers.